We’re less than a week away from Pancake Day/Fat Tuesday! So, why not celebrate in the most epic, over-the-top fashion possible? Oh yes. If we’re gonna do this, let’s do it properly. If one pancake is good, then more must be better, right? Right! I mean, why have just one crepe when you can have 25 crepes (yes, 25! ), proudly stacked to make the most awesome cake ever? And you don’t even need to turn your oven on. 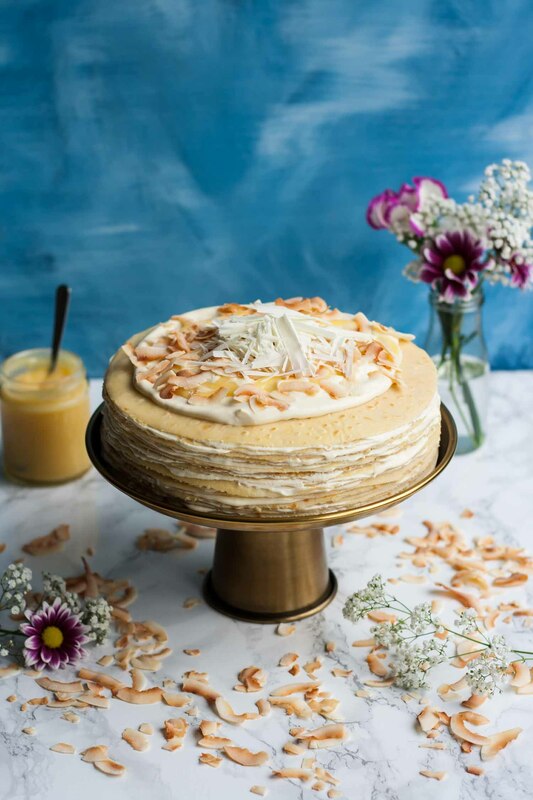 Meet the White Chocolate Lemon Curd Crepe Cake. 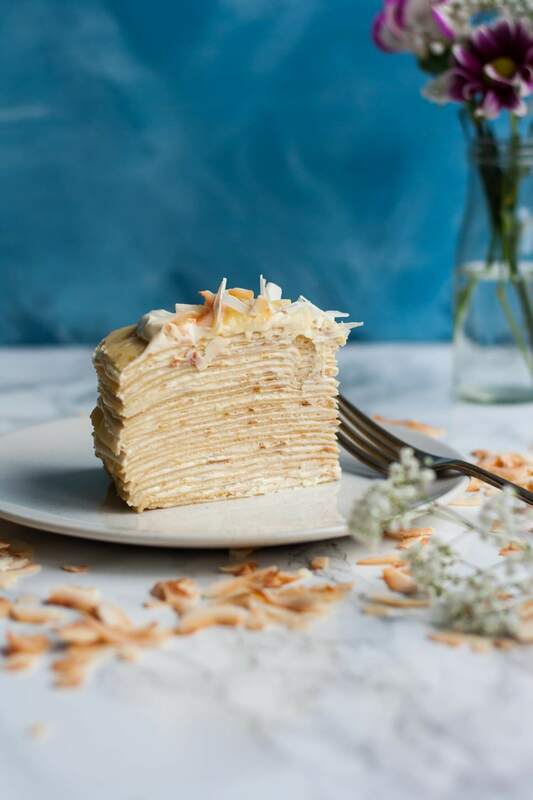 If you’ve never experienced a crepe cake before, or mille crepe cake as they’re often called, now is the time. Whoever came up with this idea originally must have been a genius! 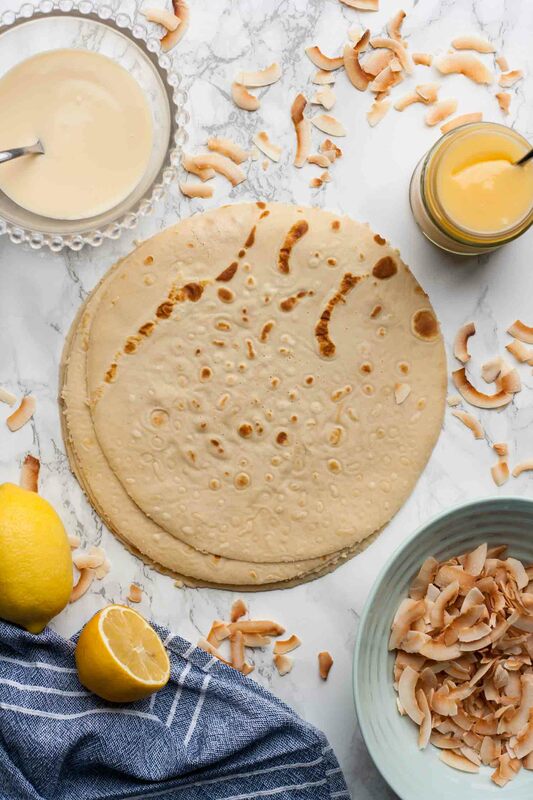 I’m not gonna lie to you, this does take a little more forethought than your regular Shrove Tuesday pancakes, topped with lemon juice and sugar and golden syrup and all of those wonderful things, but it’s certainly not difficult! In fact, I found this incredibly therapeutic to make. All you need is a little time and maybe a little more patience, but I hope you’ll agree, the end result is pretty spectacular. 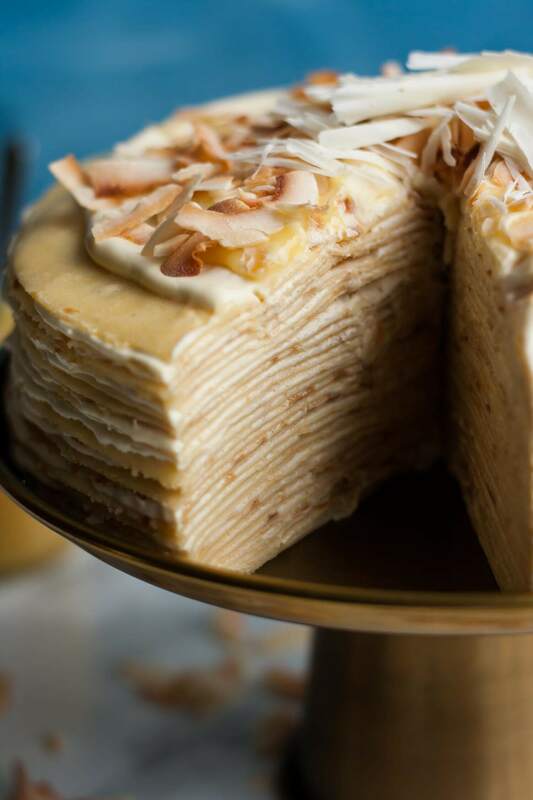 And who’s to say that this White Chocolate Lemon Curd Crepe Cake must be exclusively consigned to Pancake Day? 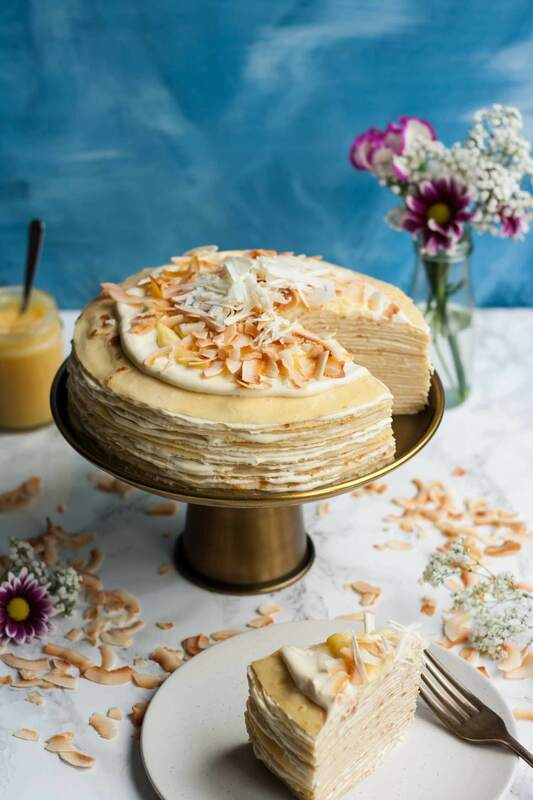 Yes, it fits the bill for that nicely, but you could make this for any special occasion – crepe cakes are even quite popular as wedding cakes these days! Or why not have a crepe cake party?! One thing’s for sure, I would definitely suggest making it for an occasion where there will be a number of you there to eat it, since it really is best eaten on the day it’s made! 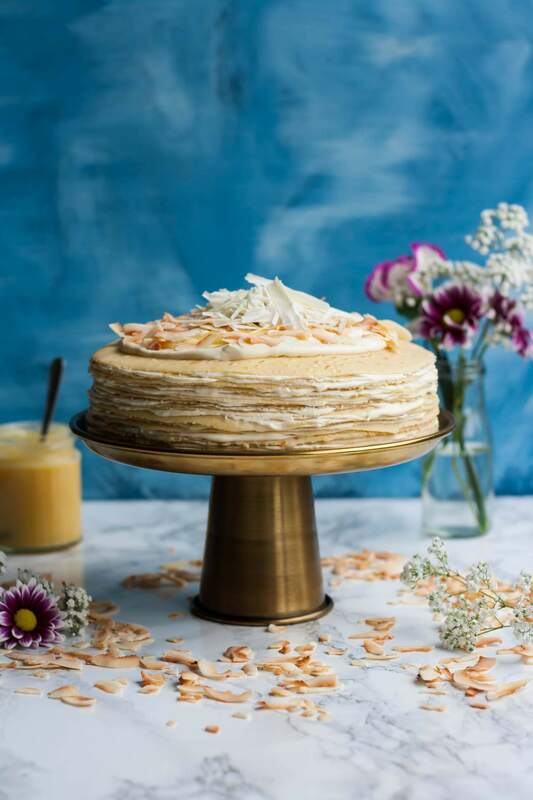 This White Chocolate Lemon Curd Crepe Cake is filled with some of the best flavours and I don’t know about you, but to me it just screams spring! I know we’re not there yet (although lately it’s felt pretty spring-like out there!) and I’m definitely not wishing time away. But I won’t lie, I really am excited for spring. For vibrant colours and fresh flavours and most importantly – more hours of daylight. The short days genuinely don’t normally bother me, but this year, I am so ready for a change. The days are already getting longer, but it’s the bright mornings I crave. So, like I said before, there are 25 crepes. You could probably get more out of the batter, but I’m allowing for some duds here. And it depends on the size of the pan you cook them in, too. I had to cut my crepes down to fit my cake stand, but I absolutely love the rustic look of leaving them whole, too. It’s up to you! And if you end up with more than 25 crepes you have two options – a) eat them then and there or b) just build that cake up a little higher! It’s a win-win situation! Each delicate little crepe is then sandwiched with not one but TWO beautiful creams. First we have my personal favourite, white chocolate crème légère, which sounds complicated, but it’s not. It’s just crème patissière (thick custard, basically) mixed with whipped cream. I know, that doesn’t make it seem much less complicated but trust me! It’s super easy to make. And so, SO delicious. Second, whipped cream is mixed with bright and zingy lemon curd. I mean, come on. So good. You can absolutely use store-bought lemon curd here, but you know me, of course I made my own and it was amazing. I could eat it with a spoon! 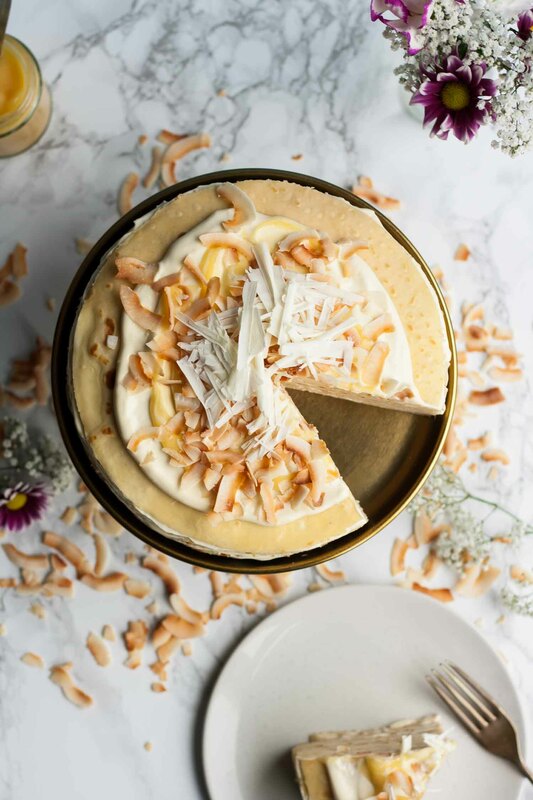 The cake is then topped off with more white chocolate crème légère, a big dollop of lemon curd and some toasted coconut for texture and to make it look pretty. And some more white chocolate because this cake wasn’t already excessive enough. Ah, life is good. 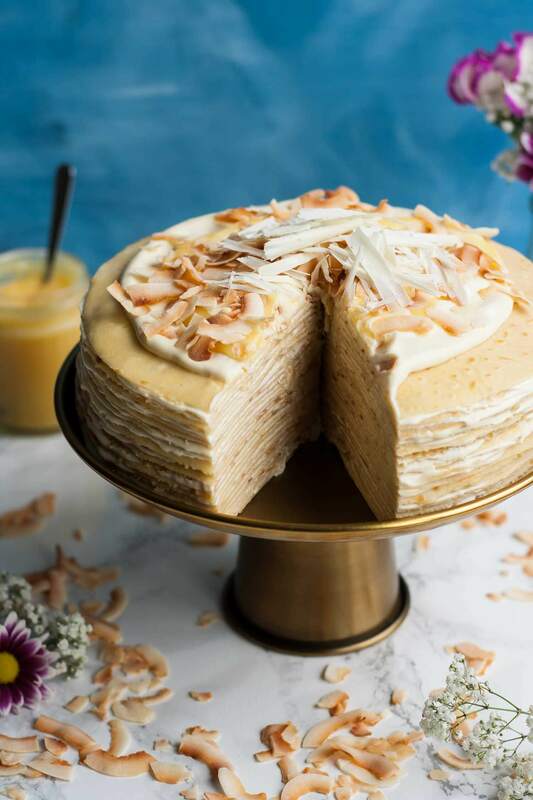 I hope you’ll give this White Chocolate Lemon Curd Crepe Cake a try! It may look complicated, but it’s far easier than it looks, I promise. Just make sure you read the recipe through in full before you begin. And be confident (and patient!) when you’re cooking the crepes. It’ll be so worth it! Add the eggs, milk, butter, flour and salt to a blender. Whiz until well-combined. Refrigerate for at least 30 minutes or overnight. When ready to cook, heat a crepe pan or regular non-stick frying pan over medium-low heat. My pan is 25cm/10" and I found that a 1/3 cup of batter was the perfect amount to make a thin crepe. Depending on the size of your pan, you might have to use trial and error to figure out how much batter to use for each crepe. Stack the crepes with parchment paper and allow to cool. Cut to the size of your platter or cake stand if needed, using a plate as a guide. Whip 120ml (1/2 cup) cream until soft peaks form. Gently fold 1 cup of white chocolate crème patissière into the cream. Whip the remaining 180ml (3/4 cup) of cream until soft peaks form. Fold in the lemon curd. Place a cooled crepe onto your cake stand or platter. Spread a thin layer of white chocolate cream onto the crepe and top with another crepe. Next spread a layer of the lemon curd cream onto the crepe. Repeat, alternating between the two creams, until you run out of crepes. Top the cake with a good dollop of the white chocolate crème patissière. Add a dollop of lemon curd and swirl with the crème patissière. Sprinkle with the toasted coconut flakes and the white chocolate curls. Slice and serve. Best served the day it's made. Place the egg yolks and cornflour in a small mixing bowl and whisk to combine. Heat the milk in a saucepan on the hob to just below boiling point. Whisking constantly, add the hot milk into the egg yolk/cornflour mixture. Whisk in the melted white chocolate. Return the pan to the heat and whisk constantly until thickened. Pour the custard into a bowl and press a circle of parchment paper over the surface to prevent a skin forming. Allow to cool. Refrigerate until needed. Inspired by and adapted from this matcha mille crepe cake from Olive Magazine. This looks so beautiful and delicious! It is perfect for entertaining. I will make this for my next dinner party. I hope mine will be as pretty. This looks fantastic and is straight to my heart. I absolutely love both white chocolate and lemon. Fortunately/unfortunately, neither are big favorites of my husband, so the big danger is that I would eat this all myself! First world problems, though… thanks for sharing this beautiful recipe! Beautiful! Just stunning pictures! Love that backdrop of blue! I would love to make this cake! 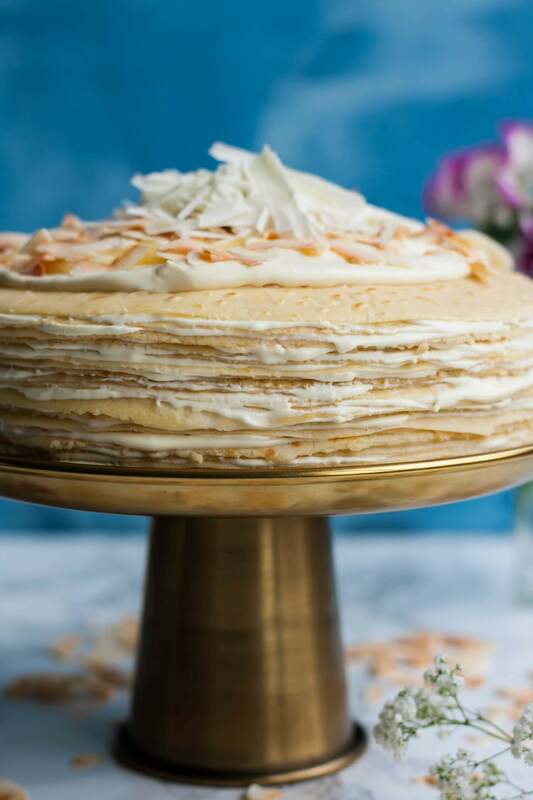 I’ve never attempted to make a crepe cake but this one makes me want to venture out and try making it! omg wow this looks absolutely incredible!! I’ve always wanted to try a crepe cake! Thank you Veronika! It was fun to make!